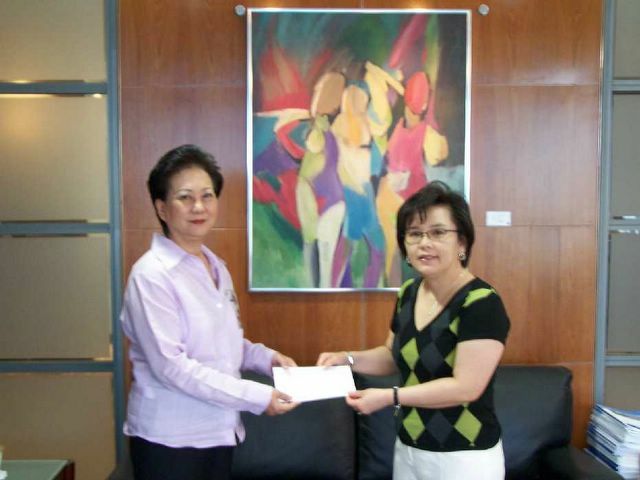 of TISCO Finance presenting her Birthday Donation check to Khun Pattira. 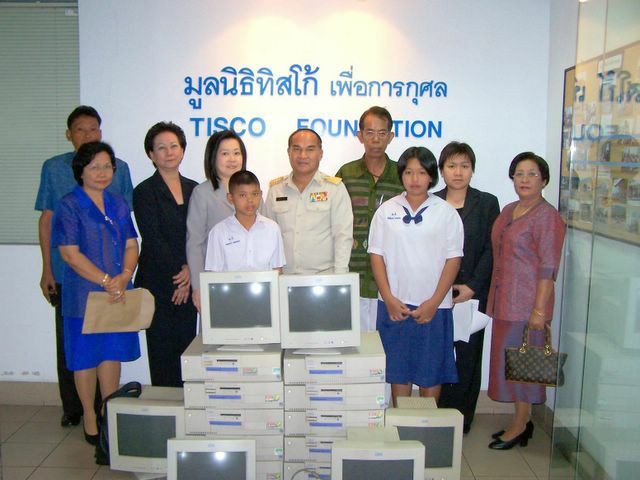 It is tradition that TISCO employees make merit on the occasion of their birthday anniversary by making a donation to the Foundation. Donations to the TISCO Foundation are tax deductible. 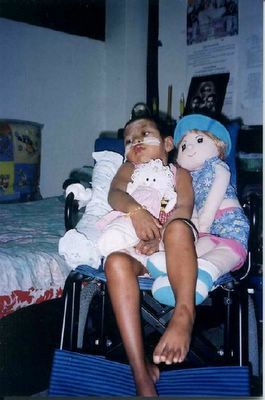 Orawan Chaiyakong, 3-year-old patient at Taksin Hospital, received a new wheelchair from TISCO Foundation in April 2005. 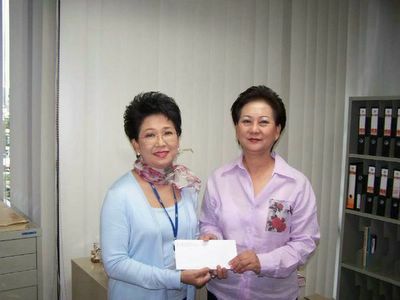 Khun Sasinee Phattiyakul Head of Corporate Service TISCO Finance presenting her Birthday Donation check to Khun Pattira. Mr.Pongsak Phiwployngam ("O") the new Foundation's Administration officer. "O" just joined the TISCO Foundation for 2 months. He replaces Thanawat ("Song"). Mrs.Pattira Wattanawarangkul, Manager and Mr.Weerasak Pattanasinwanich, Asst. Manager, watching "futsal" Compettition at Lumpini Park, it's one of activities of the Foundation. 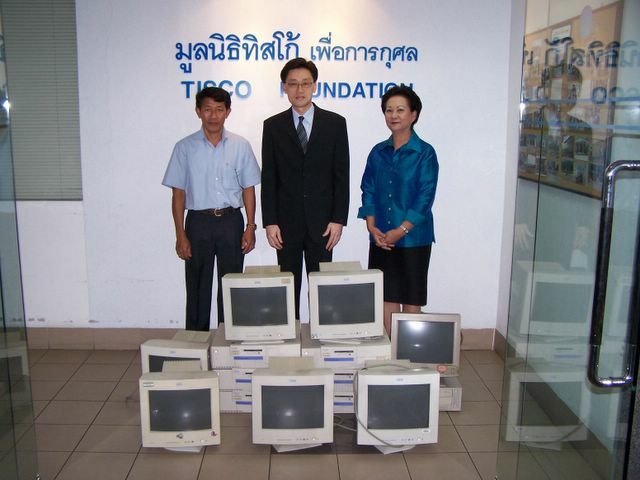 Khun Weerasak just joined the TISCO Foundation this month. 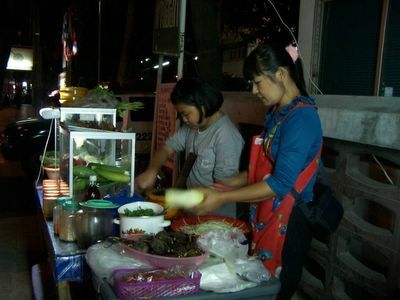 Khun Sommai Ung (Ob) from SAM-AS presents 6 PCs. to the Director of Baan Nong Rang School Ratchaburi Province. Food shop : Mrs.Arporn Chuypetch receives a food shop in Tab La Mu Navy Base at Pangna Province, with 10,000 baht occupational fund from TISCO Foundation. (In the picture Mr.Thaval Vichitvatee Credit manager of TISCO Finance provided cooking equipments and occupational fund to Mrs.Arporn. 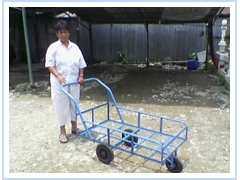 Mrs.Chud Dermburi received 6,000 baht occupational fund and a new cart from TISCO Foundation. 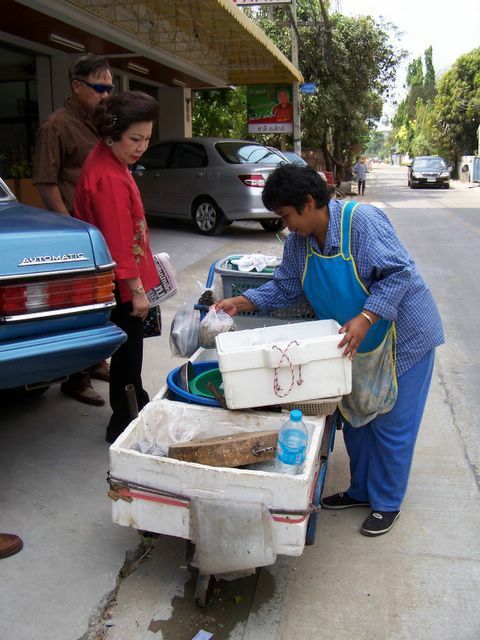 Khun Vannee interviews Mrs.Chud Dermburi a seafood seller along Vibhavadee road with broken cart. More hard work! 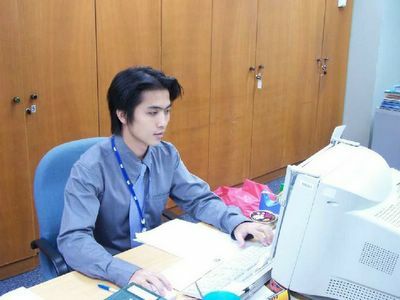 Somkid Promsap ("Kid") is the accounting officer of the Foundation. 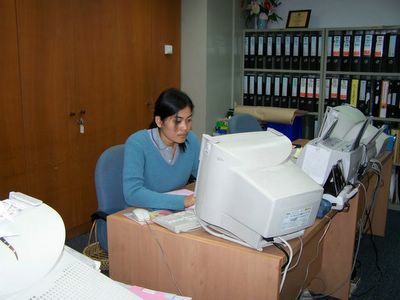 Foundation staff working hard. 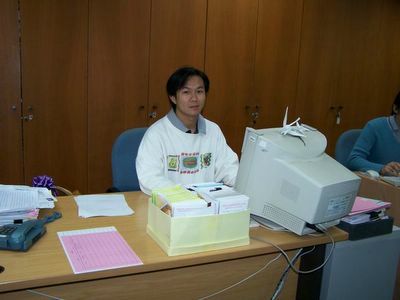 Kannikar Mephan ("Bee")- Senior Officer of the TISCO Foundation. 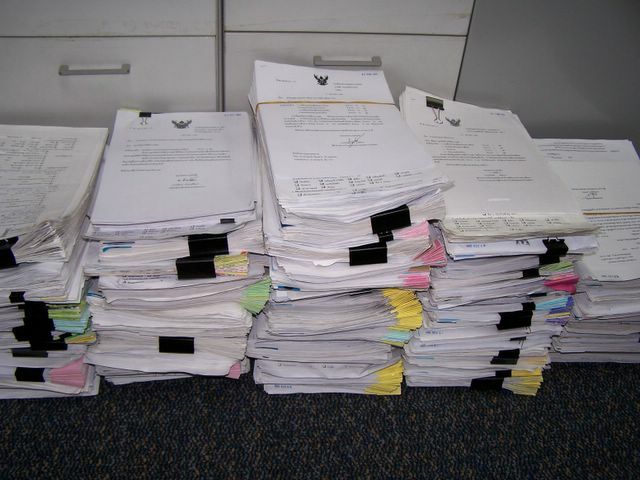 Piles of scholarship applications are being processed. 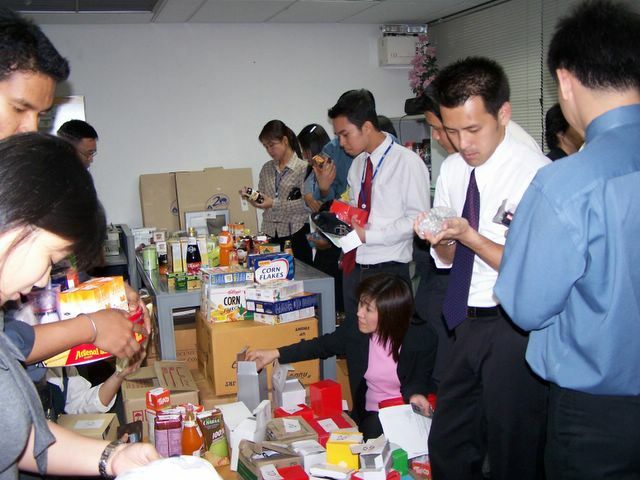 TISCO staff help fund raising by buying TISCO customers' gifts. 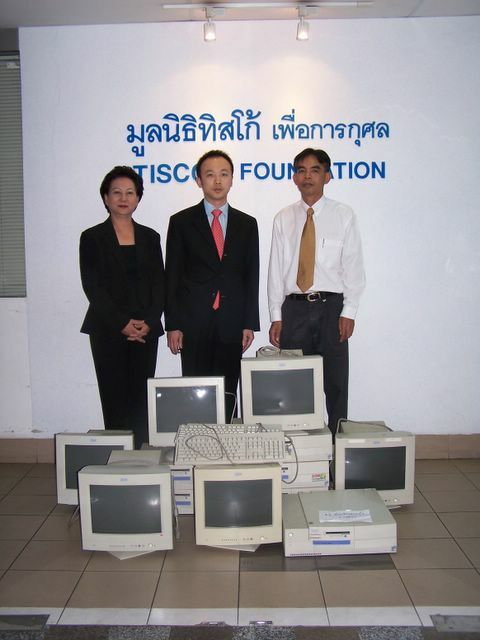 Foundation Manager, Khun Pattira, poses in front of Foundation Office. Khun Pattira, Khun Vannee and Khun Srisooda process student scholarship applications. Ladda of Custodian Service, TISCO Finance, presents TISCO Knowledge Poster and 10 PCs. 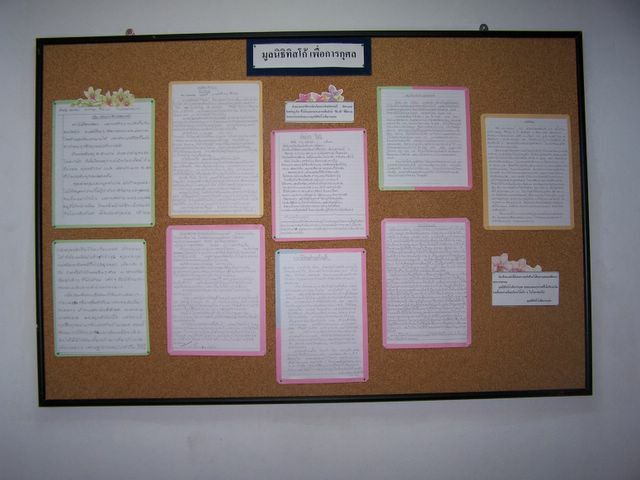 to Director of Baan Klong Song School, Suratthani Province. 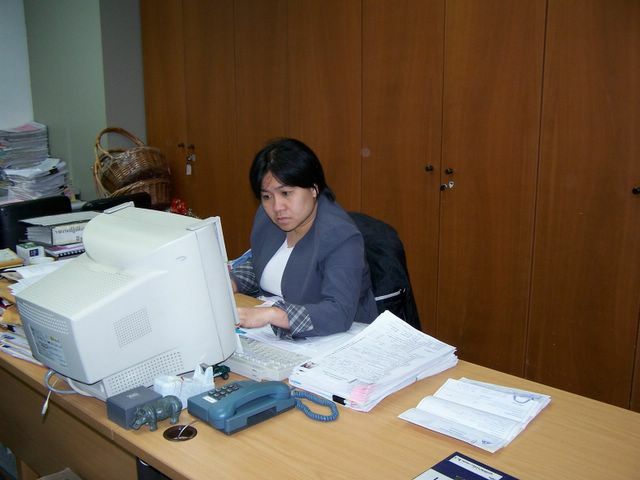 Mrs.Ladda (Mieng) Kulchartchai from Custodian Service, TISCO Finance, presents 10 PCs. 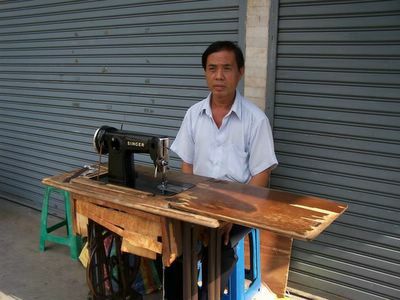 to Director of Mahachanachai School, Yasothorn Province. Mr. Tom (Paiboon) Nalinthrangkul from TSEC presents 10 PCs. 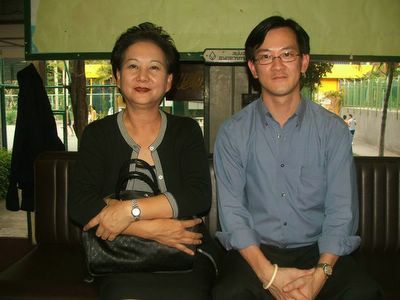 to Director of Baan Nong Kratoom School, Ratchaburi Province. 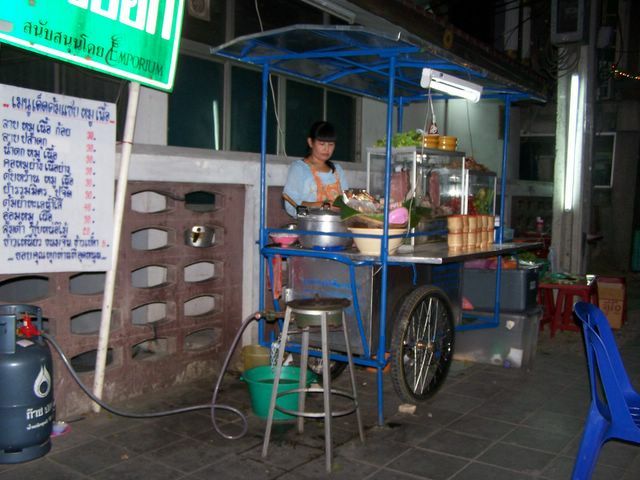 New Som Tam cart provided by TISCO Foundation: Mrs.Somrak Suwanno received 12,500 baht occupational fund from TISCO Foundation. Mrs.Srisooda Boon-Long, Director of TISCO Foundation, visited Mrs.Somrak Suwanno's house at Thonglor police station apartment. 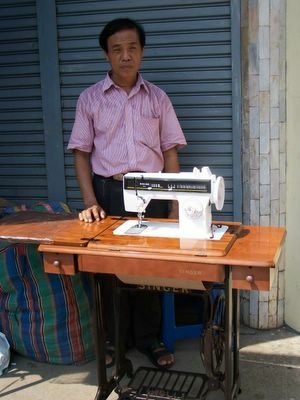 New sewing machine provided by TISCO Foundation: Mr.Pairin Wankij received a 9,400 baht sewing machine from TISCO Foundation for his occupational assistance. Old sewing machine: Mr.Pairin Wankij uses a very old sewing machine to repair clothes on sidewalk near Bangsue police station.